Imagine what it is like to be an 11-year-old student, fresh from elementary school, joining a campus of 6th-12th graders. This transition is a time of accelerated cognitive, physical, social and emotional growth. How can a young person successfully manage those changes as they develop their identity? 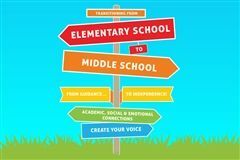 During the transitional middle school years, it’s important for students to explore and express who they are as individuals and as part of the global community. Art teacher Ms. Yehee Shin finds creative ways for students to learn the basic elements and principles of art and design through the lens of that self-exploration. For their most recent project, Ms. Shin challenged her classes to look within themselves and create designs for a platform that many of us use every day, Google. One of many lessons that explore the concept of identity through art, the Doodle 4 Google project gives our students an opportunity to design collaboratively, individually and for a real audience. Last Wednesday our entire Middle School participated in discussions and activities to bring our community together through positivity and determination. 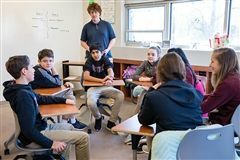 Faculty advisor Ms. Diana Talbott and the student-led Community Life Committee hope this day inspires, encourages and motivates our entire middle school to develop more positive mindsets. This annual event is an opportunity for students to practice advocacy, leadership and empathy while building strong relationships outside of their normal social circles. For the third year in a row, the Zimmerman Library hosted an all-day African American Read-In for students on Teel Campus. To celebrate Black History Month and highlight literature by African American authors, librarians Ms. Whitney Etchison, Ms. Diana Michel and Ms. Mary Carrington covered the shelves in a variety of books ranging from literary classics to contemporary graphic novels. 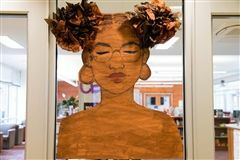 Students from Upper School Art Club and Multicultural Alliance also decorated the library with original artwork and poetry written by African American authors. With snacks, comfy seats and quiet nooks around every corner, it was a great day to grab a book and read-in.